I’m a little delinquent on my post here. Because well, I wasn’t home for the holidays for a week, I was off doing my Magical Pop Up Shop! I’ll do another lengthier post soon on the tree shop. I came home from that and literally got out of the car and ran down the steps into the studio and starting shipping like crazy! Bing bang bam packages and product flying everywhere and out the door to all my awesome customers! I was shipping through the 23rd, with a half a day escape to put my tree shop display in storage so I could park in my garage, and a lunch visit with a dear family friend on the 22nd. Then with a half a day to prep for family coming on the 24th and 25th and a project in between, well, my legs felt like noodles from exhaustion and there’s not much rest here still. And here in the exhaustion, the rest of the holiday decor happened, so last minute, there was almost no real tree this year, and then there were 2 because I was so late they were half off, so why not. 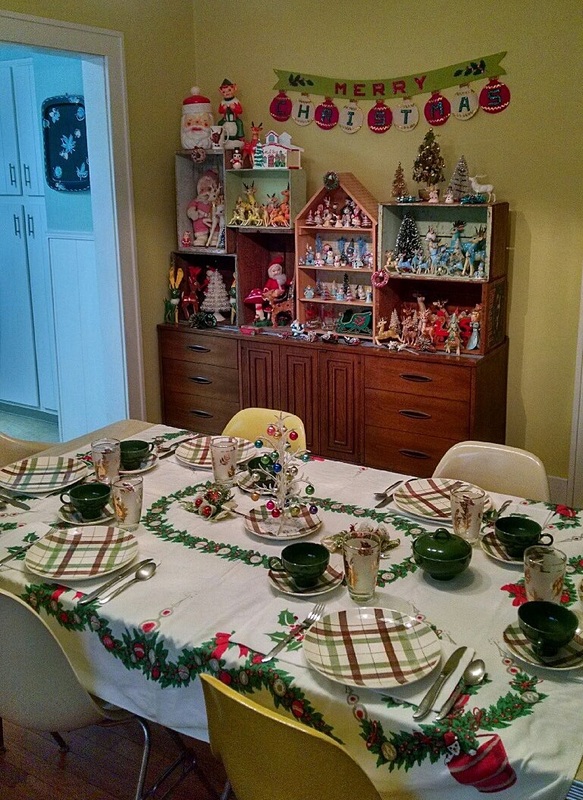 Enjoy the decor, and Happy New Year to you and yours! Stay safe if the weather outside is frightful. The Christmas eve and day walks were welcome and the dandelion sighting was odd, we knew it couldn’t last.We’re now in the middle of an ice storm here in MI, yep, winter has finally found us again. You may have noticed I moved the small aluminum tree and replaced it with a real tree in it’s usual place of honor, smells so good! A view from the kitchen into the dining and living room. 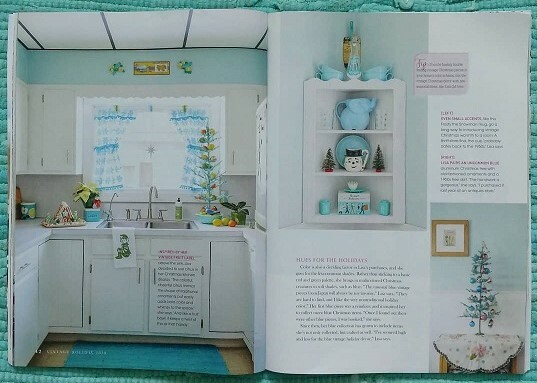 The kitchen nook. All is calm all is bright. 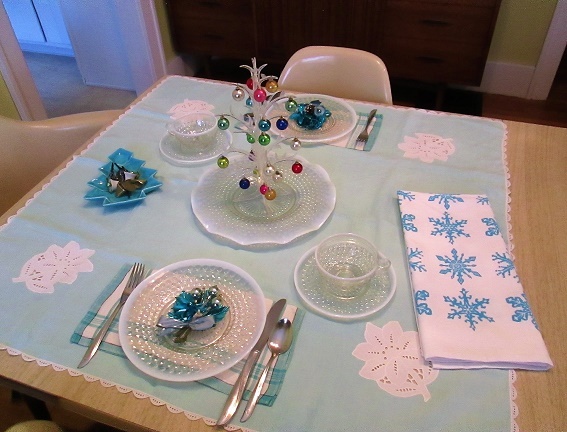 Custom aqua artgoodies doily stockings, a vintage bottlebrush tree on the table with my Marcrest Stetson Swiss Chalet plates, pinecone shaped lights, and tinsel wreath with blue vintage bells and ball accents. I love the icy holiday magic here. A rare look at the other side of the dining room. Switched the drapes out again with a pair that hung in my grandma’s dining room. 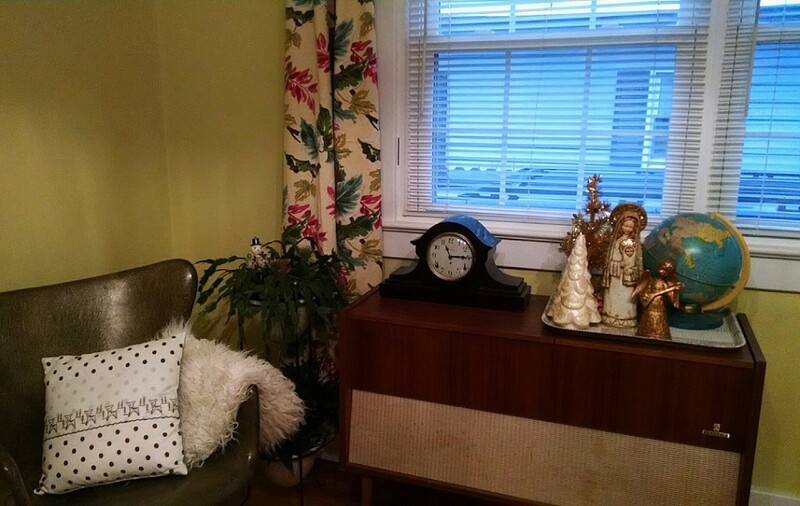 A clock from my great grandmother, grandpa’s stereo, an array of gold holiday decor and globe atop a vintage George Nelson and Assoc tray, amazing vintage Peabody fibgerglass chair, vintage flokati rug accent, and handmade vintage deer trim pillow., oh and a mid century planter as well. Here’s a new space for my holiday decor. 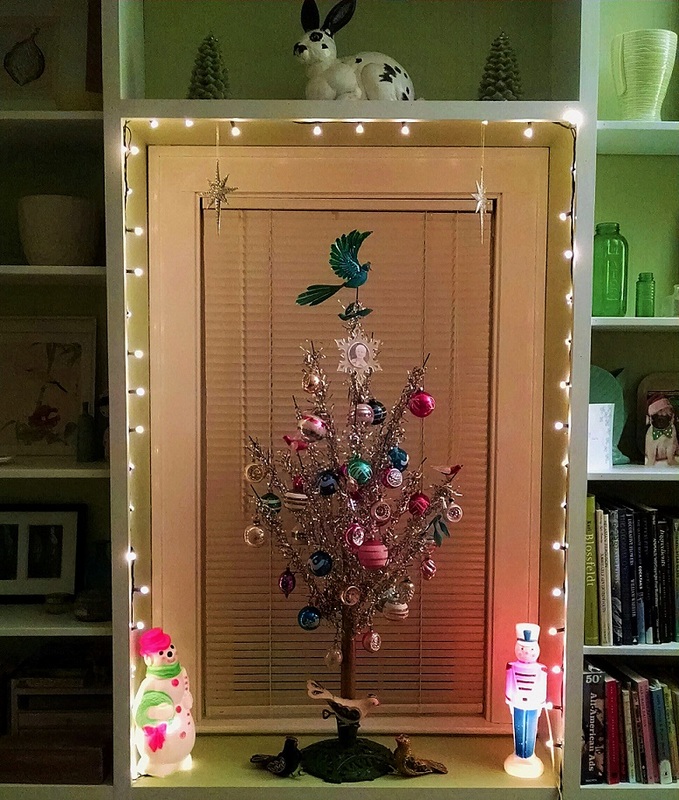 I got a skinny mini tree and some new blue, green, and white lights and thought, YES, a blue and green front porch vintage style holiday! 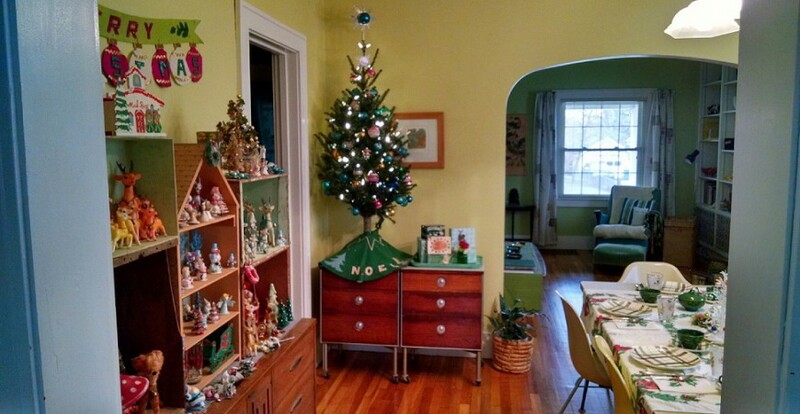 The little tree has vintage blue and green ornaments with handmade bead snowflakes and a few new ones too. 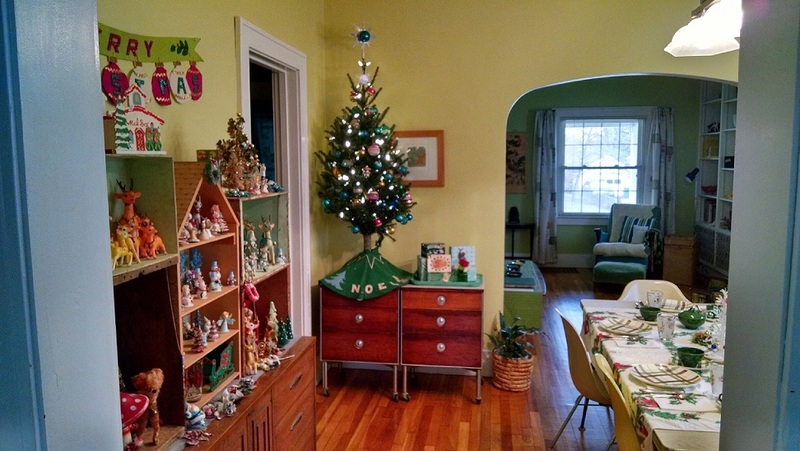 A vintage angel topper, and a little handmade vinyl vintage tree skirt complete the look. artgoodies recycled felt stockings in snowflake and elf hang above, snowflake pillows, and elf stuffies replace some of my usual pillows, and the awesome vintage hand painted reindeer sign fits perfectly on the wall! And you can see it from outside, so bonus, it greets guests with a happy holiday vibe! Here’s where the little aluminum tree went, which worked out great since I could light up both little blow molds! The perfect size to be featured in the window, and I decided to keep that antique stand I had for sale, it worked perfectly for this tree! And speaking of greeting guests. I just love this little vintage toolbox I thrifted a few years back. It’s really fun to change out seasonally. It’s amazing how much your little city yard can provide. Look at all the magic stuffed into this little box! 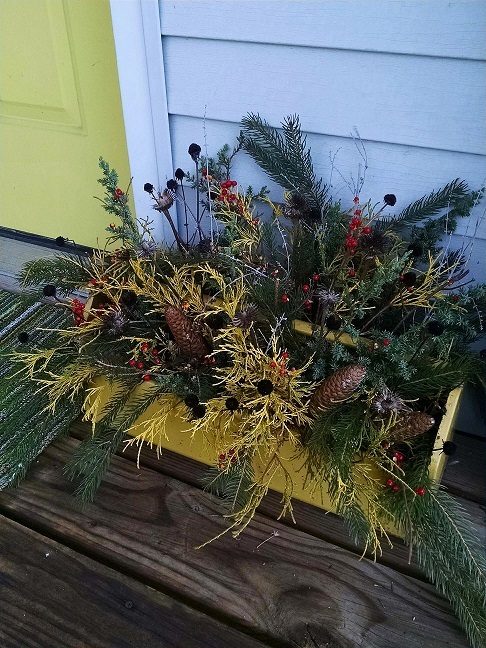 3 different style pine cedar branches, pine cones, berries, dried flower seed pods, some silvery sage. 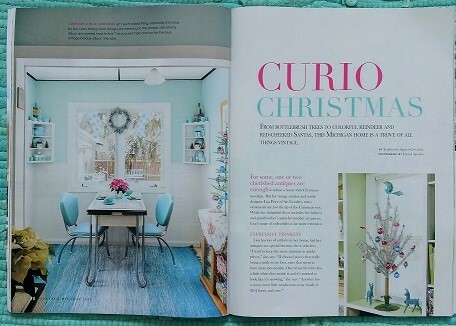 It’s so welcoming at the door and always fun to design! This year as I pulled my geraniums out I even had one with a bud, on Dec 23rd! 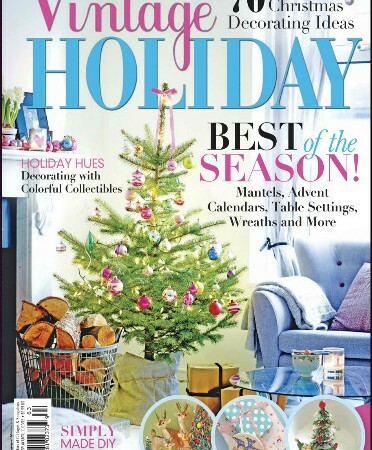 In lieu of color of the month, the annual home for the holidays December edition! I’m hustling and bustling as usual over here and getting ready to go to Chicagoland in a week for my magical pop up shop INSIDE the bottom of the giant Christmas tree! So I’m extra busy, no time to waste! It’s fun to mix up the holiday display a little every year! 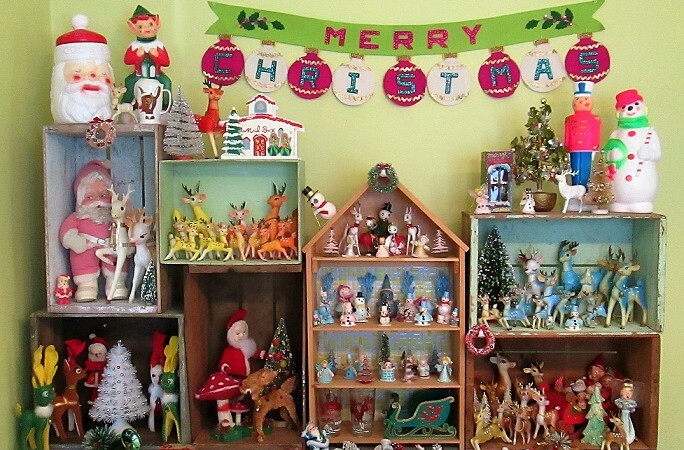 A change in the boxes including the addition of a little house shaped one, some new blow mold lights, a plastic Santa cookie jar, new bottle brush trees, a few new colored reindeer, and a few new small friends too! I have sold some pieces in case you’re wondering, and you might wanna head to the vintage shop to scope out the well stocked vintage holiday section there! 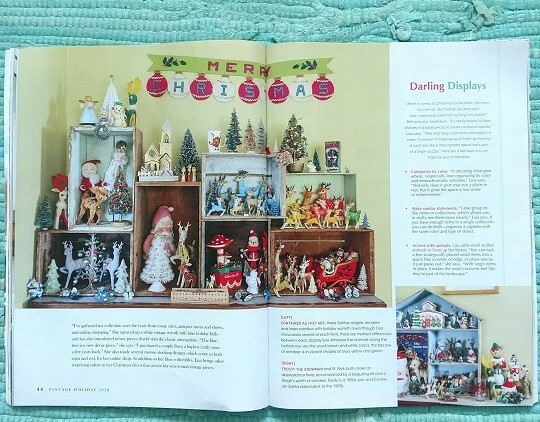 After the feature in Vintage Holiday Magazine Fall 2015 issue I felt like I could let a few pieces go and begin to rotate a bit. A nice shot of the dining room table and the credenza display! 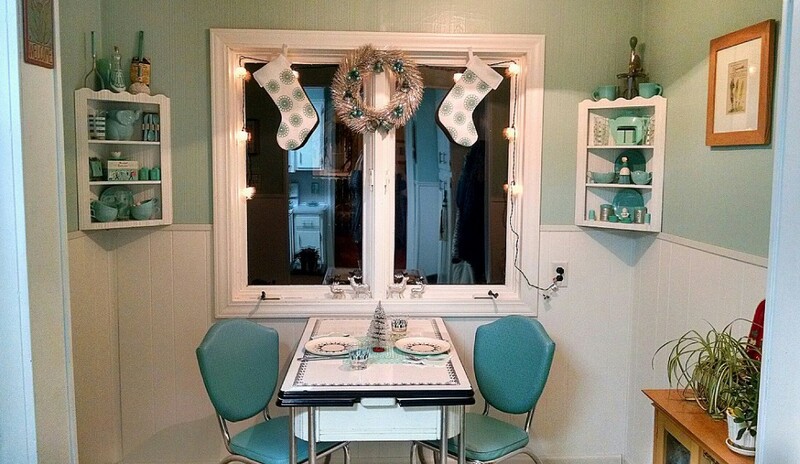 Table setting Dec 2015! 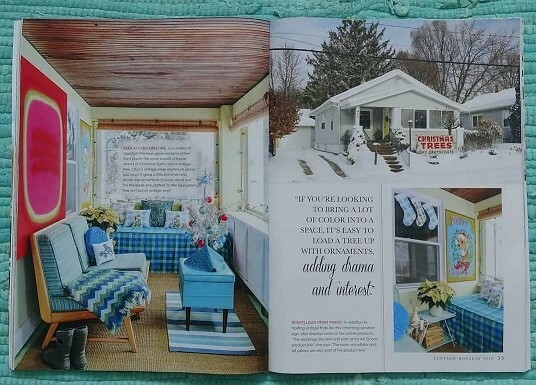 I LOVE the icy winter look of this! The vintage moonstone glass dishes lend themselves so nicely with the blue! 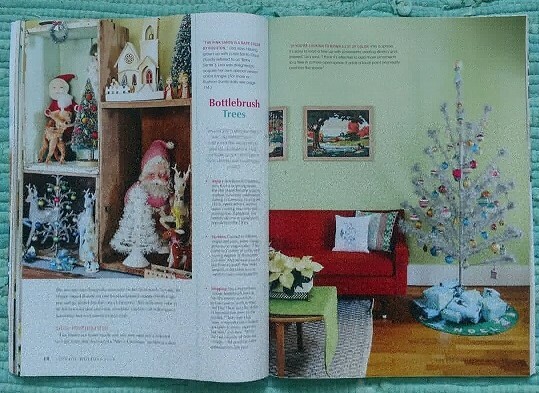 A few blue corsages add a nice touch, and a little Shiny Brite table top tree is always a favorite holiday accent of mine, plus you can’t go wrong with an artgoodies snowflake towel! I’m SUPER excited to share this with you! 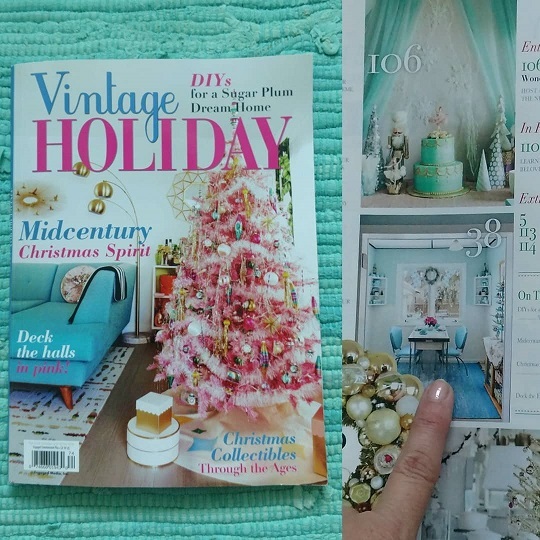 Check out the Fall 2015 issue of Vintage Holiday Magazine! 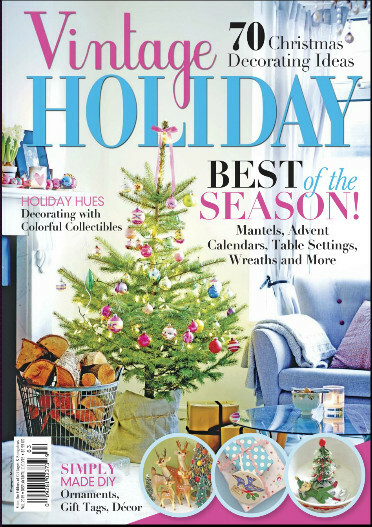 It’s a special issue from the editors of Cottages and Bungalows on newsstands NOW through Nov 10! 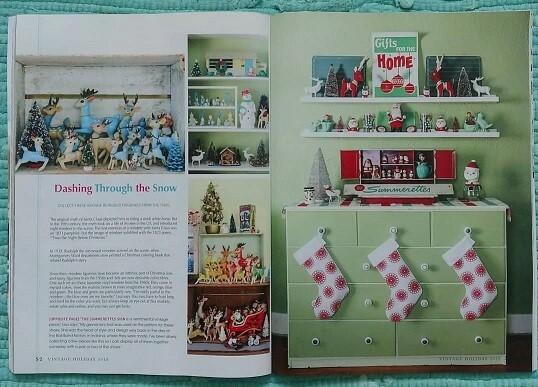 It features my vintage holiday collection, an interview, tips, quotes, and I was even the photographer for this one!!! 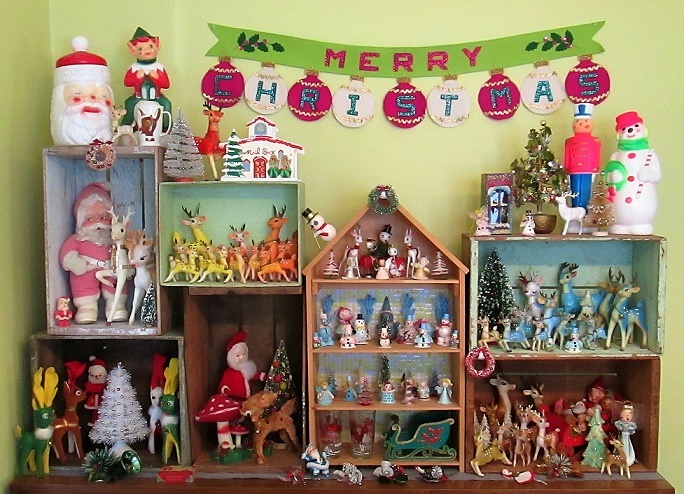 PLUS don’t forget I’ll be stocking up the holiday section of my vintage shop with TONS of vintage holiday from now through Christmas, so check back often as I list amazing treasures, no doubt even some from my own collection! 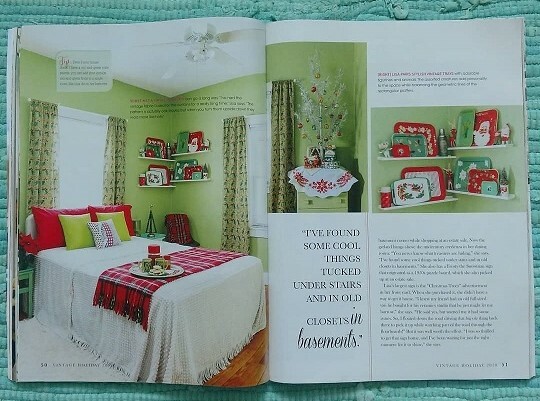 A HUGE thanks to editor Jacqueline deMontravel who was awesome to work with on this project! 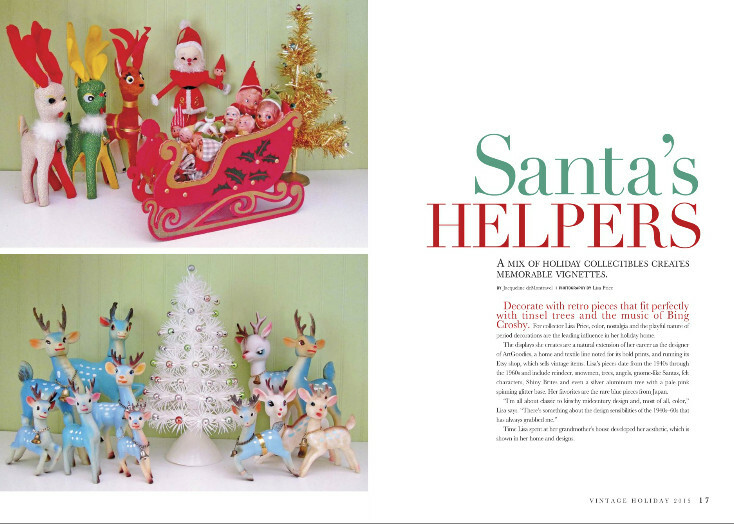 On the cover you’ll see some of my little deer saying hello in the first circle, then flip to page 16 for 4 pages of vintage holiday magic! Check it out below along with some extra shots and if you’d like to see more flip through my past Dec blog posts, or click on over to my flickr holiday page for a few more shots starting with its humble beginnings! One last thing! You just might need some artgoodies holiday products to go along with your vintage holiday collection, say a NEW knee hugger elf or all over elf tea towel? Check out artgoodies holiday items here, OR now you can conveniently shop right here on the main artgoodies website! SO many options for my customers! Have fun looking around everyone! 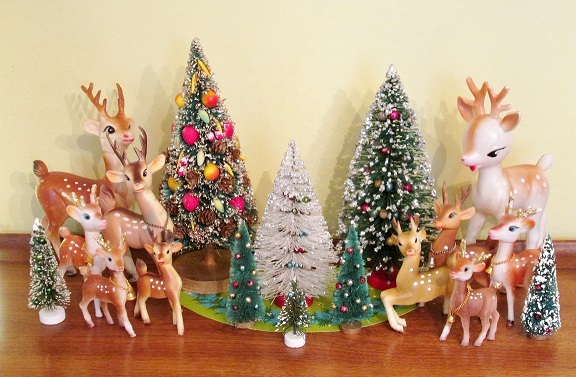 Seen here: Vintage rubber reindeer and a few blow mold reindeer pals along with a selection of bottle brush trees. My favorites seen here! 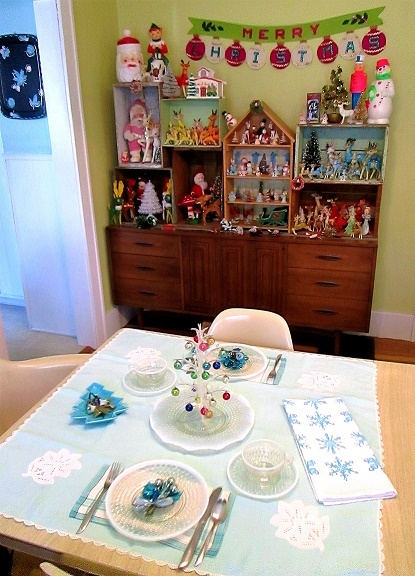 My rare blue vintage holiday Japan collection, and a few pink pals in the mix too! 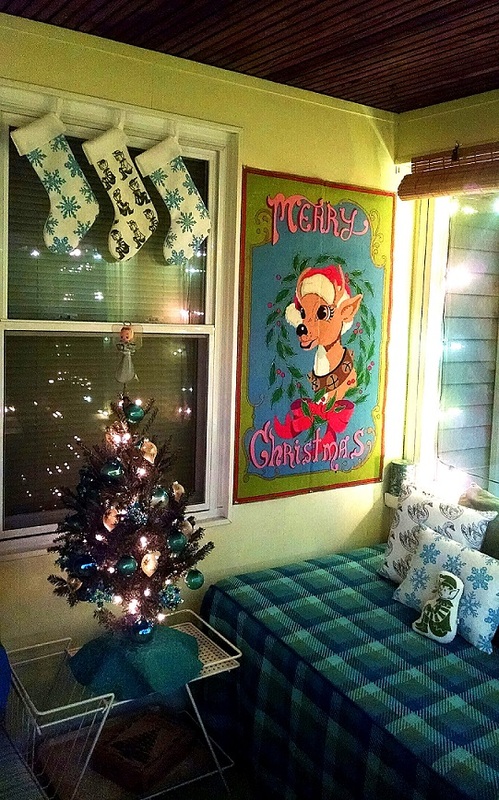 Blue reindeer, snowmen, trees, angels, elves, and a blue glitter Santa too! Rubber, plastic, spun cotton, etc. 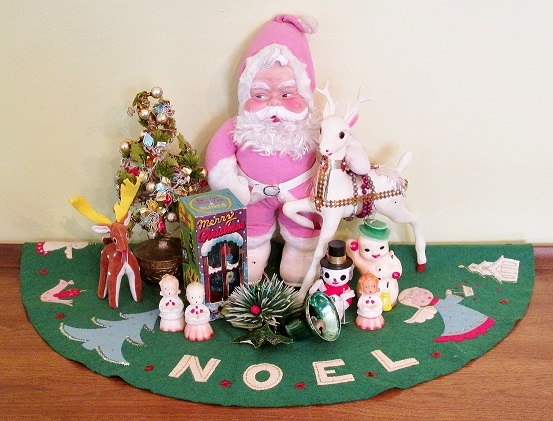 Rare pink Rushton Santa, AKA “baby Santa”, large celluloid reindeer, Gurley candles, sawdust reindeer, NOS blue musical tree in box, Japanese tabletop tree, bell corsage, and a felt tree skirt with blue and pink details! 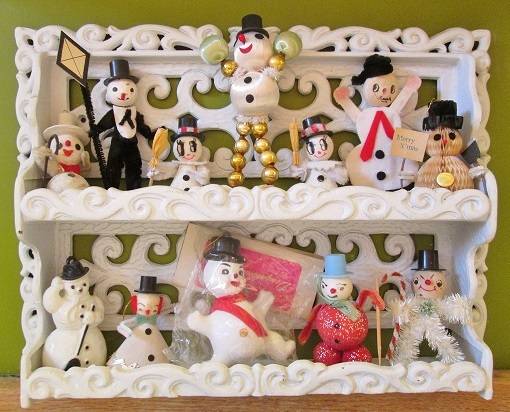 Seen here: My bathroom shelf decked out with little snowmen. Some happy, some kinda mad, I love them all! 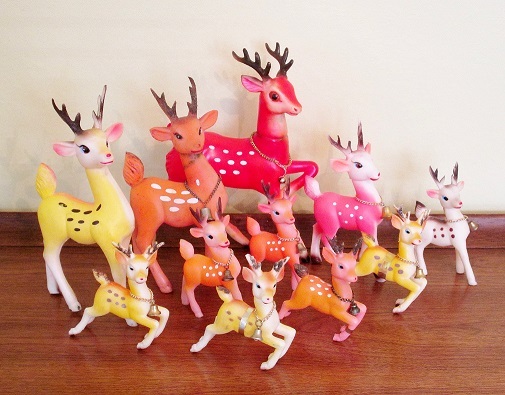 Seen here: A colorful collection of hard to find Japanese rubber reindeer! White, yellow, orange, pink, red! I’ve alwasy got my eye out for blue and other color friends! 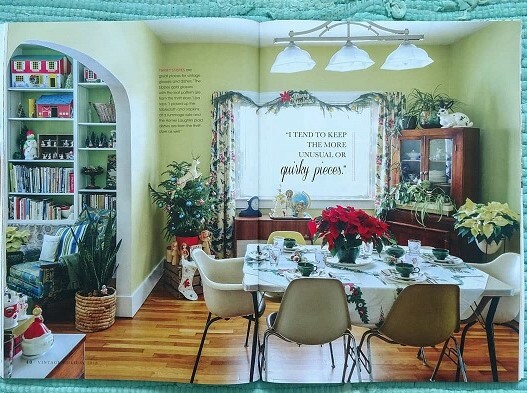 Seen here: A menagerie of white and gold, green and red. This is as traditional as I get. 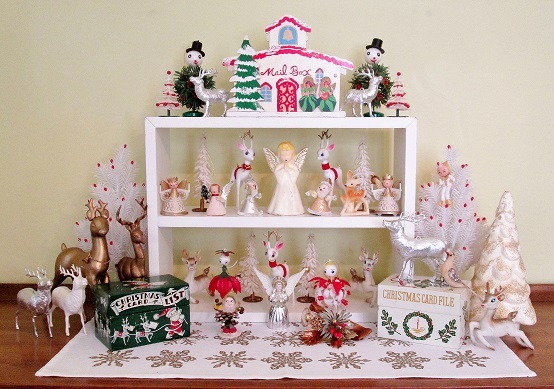 My favorite are the weird poinsettia pals on the bottom, the round headed white reindeer, Christmas list box, and card mailbox! 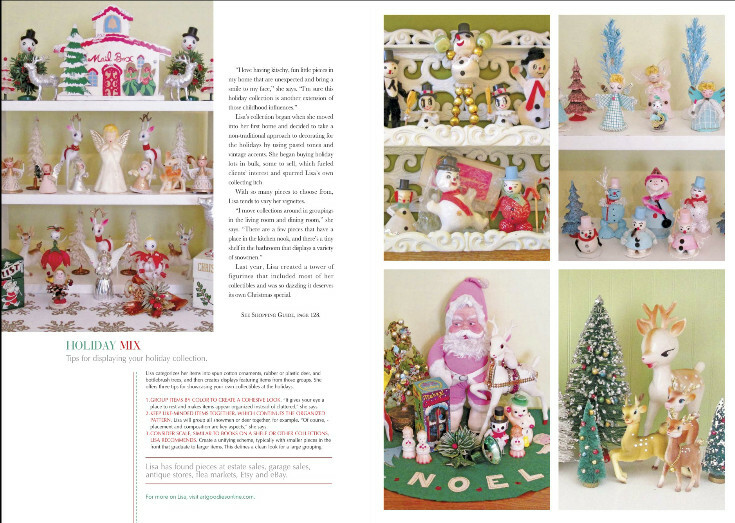 Seen here: The towering holiday display from last year that was mentioned in the magazine article. It was fun to have most, not all of course, of the collection in a condensed area to take it all in. 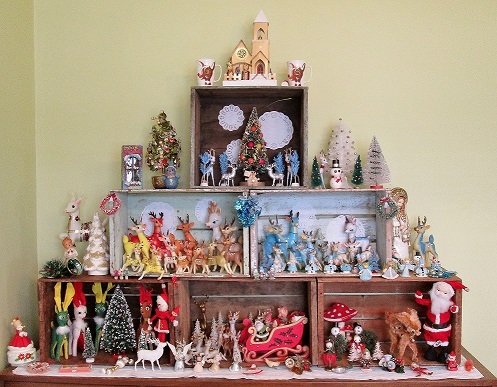 Seen here: A shot of the great wall of all holiday display with a Shiny Brite tabletop tree and plastic folding sleigh with knee hugger elves. 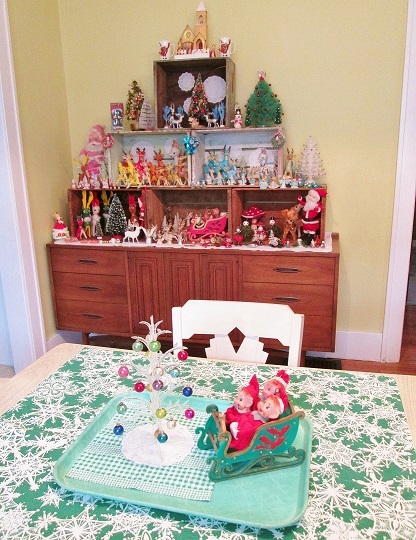 I have SO many more vintage holiday items I could show you! 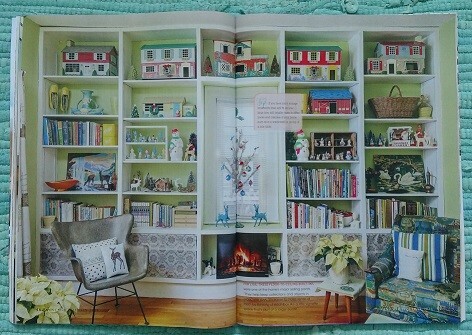 Stay tuned for this year’s Home for the Holidaze posts for those!